This entry was posted on August 14, 2018 by Magnattack. One of the largest risks to profitability in winemaking is damage to expensive processing equipment. Metal contaminants such as wire and vine fencing staples, and small-medium sized tools such as hammers and brackets, enter the grape receivals area and cause significant damage to downstream equipment. Magnattack™ Global technicians were recently contacted by a winemaker in the Barossa Valley who was experiencing this problem. Loss of productivity and costly emergency repairs and replacements during the grape crushing period were impacting the business. 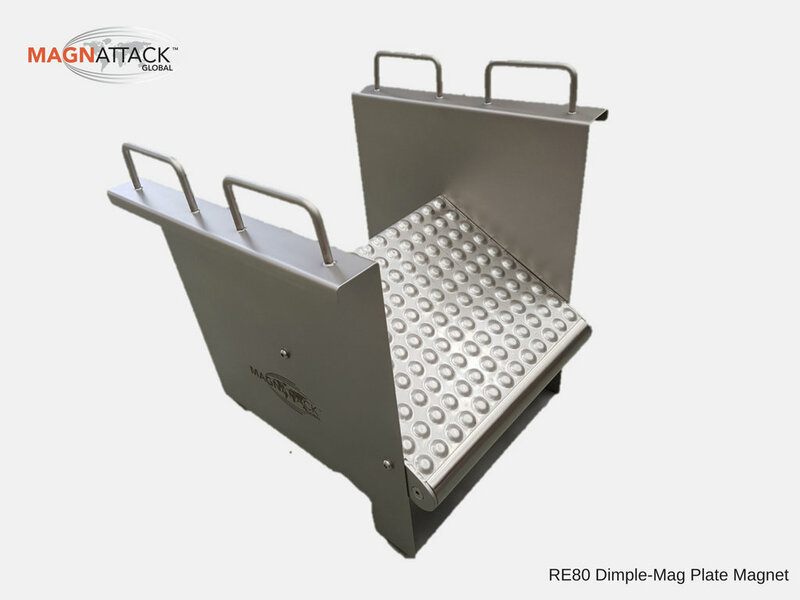 After investigating the application, Magnattack™ technicians recommended the RE80™ Dimple-Mag™ Extraction System. The system consists of a specially designed Magnetic Plate paired with a high-intensity RE80™ 10-11,000 gauss Magnetic Separation Bar. It was designed by Magnattack™ to overcome problems associated with grape bunches and debris becoming entangled around Multi-Finger Receival Bin Magnets, another magnetic system that has become popular throughout Australia and New Zealand. The configuration of the system improves the capture of magnetics and without hindering product flow or compromising product coverage as experienced with conventional bar/grate magnets. The Dimple-Mag™ was installed in the de-stemmer hopper under the grape receival discharge screw. The Magnattack RE80 Dimple-Mag Extraction System. Wine processing equipment are not only valuable assets but are also expensive to repair…especially if emergency repairs are required during the high-pressure time of the year at grape crushing time. 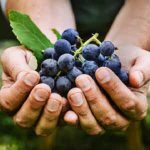 As soon as the grape crushing season began, the customer experienced the benefits of having a high-strength, effective magnet in their grape receivals. 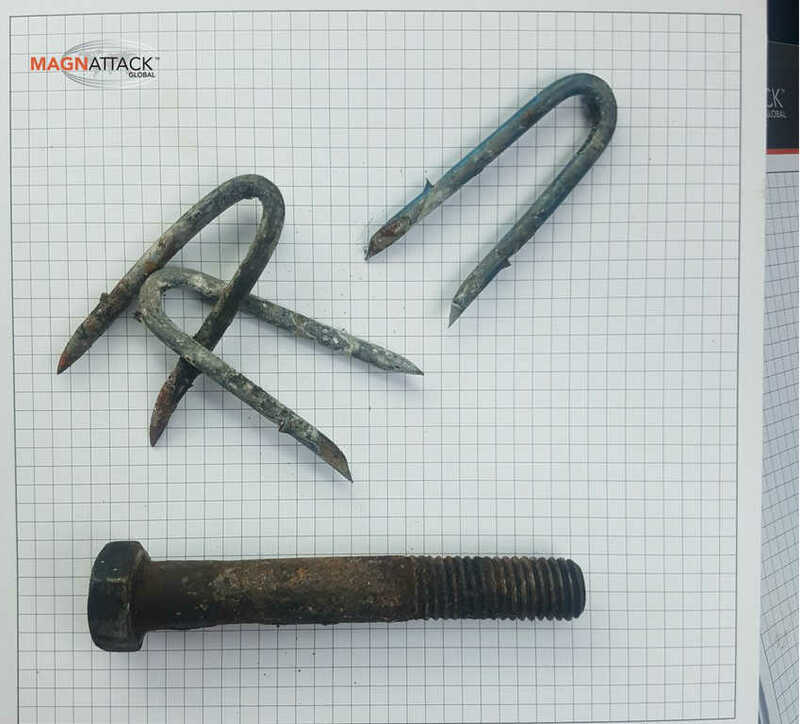 Commenting that the system had paid for itself multiple times within 3 days, the customer reported that large lumps of steel, long blades, and small hammers had been collected by the magnet – preventing damage to their equipment that would have resulted in unplanned production shutdown and costly repairs as in previous years! Over time, the customer also noticed a significant improvement in the condition of sensitive assets downstream such as their bag press, de-stemmer, lacerated knife valves, etc. For the 1st time ever their Must Pump did not require an overhaul at the end of crush because it was still operating efficiently due to the absence of sharp staples shredding the internals! 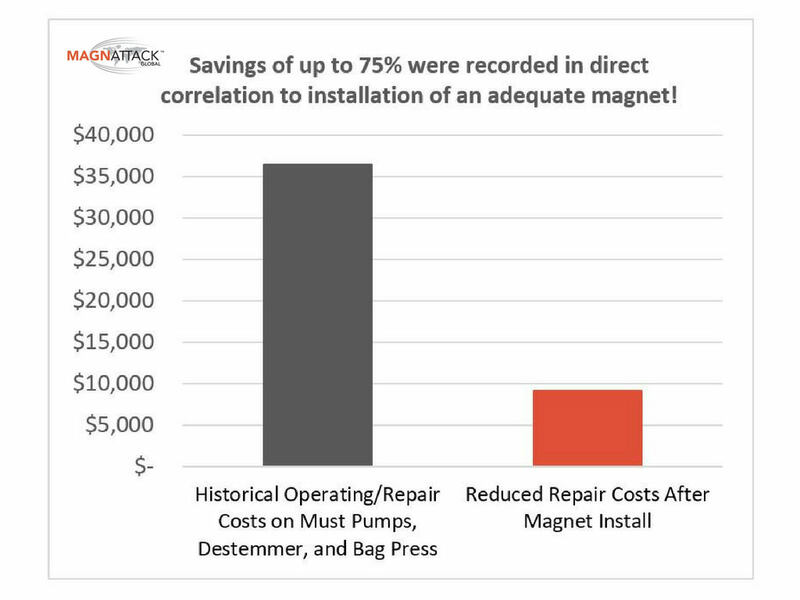 Over a season the magnet helped reduce wear and tear on process equipment that could accumulate a significant expense. Some of the metal contaminants collected by the Dimple-Mag after installation. Plus costs of downtime for investigation/repairs and loss of production. Contrast these costs against the once-off expense of the Dimple-Mag™, and the return on investment is impressive: relatively low start-up cost + immediate results = money saved! The RE80™ Dimple-Mag™ System is a low-cost solution for a high-cost risk! Also available from Magnattack™ are the RE80™ Multi-Finger Style Receival Bin Magnets. It is important that your magnet supplier fully understands the application in order to provide an effective solution. Experienced Magnattack™ technicians can provide expert advice on how to reduce your risk of equipment damage, repair costs, and plant downtime to suit the configuration of your existing process line. So glad these types of magnets are aiding in the preservation and solutions within the wine industry. Great wine comes with great cost and great equipment! Glad to hear some companies are making these investments. Thank you for sharing!